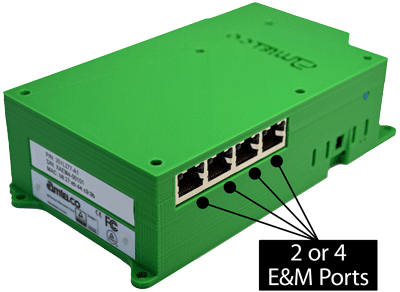 NEW 2-Port and 4-Port E&M Gateway Appliances! Click here to find out about the NEW E&M Gateway Appliances! The XDS Dual T1/E1 Appliance provides an Asterisk®-based telephony system with two T1/E1 interfaces. It can be used as a VoIP gateway product supporting up to 60 VoIP channels connected to the PSTN or a PBX environment via T1/E1. Additionally, the T1/E1 interfaces can be used in a high-impedance mode and combined to provide a tapping/monitoring function. In this mode, incoming calls from either interface are sent to the Asterisk dialplan for connection to other IP telephony resources. The audio streams from the T1/E1 interfaces are combined and sent to the connected VoIP resource for recording or monitoring, as needed. *Telephony systems may under some circumstances experience the phenomena of excessive echo where speech is reflected from the far end with a noticeable delay. This is particularly true when the call involves VoIP, satellite links, or analog endpoint devices that combine the audio paths into a two-wire interface through a hybrid circuit. To combat this echo, the T1/E1 appliance is available with an optional echo cancellation feature that is integrated with the ISDN interface. Click here to learn more about the Dual T1/E1 Appliance! A compact size, Asterisk compliant, and very competitively priced! Click here to find out more about the E&M Board! 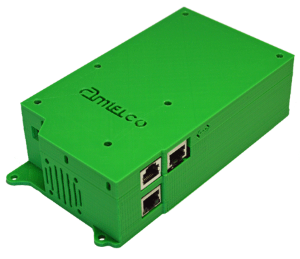 In addition to the 2/4-Wire E&M Board above, Amtelco also offers additional XDS Host Media Processing (HMP) solutions that are available in the PCI or PCI Express formats. 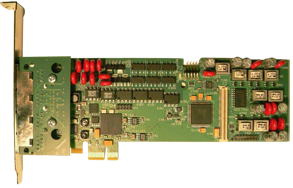 Click here for more information on the HMP T1/E1 Board! Click here for more information on the HMP Modular Board! 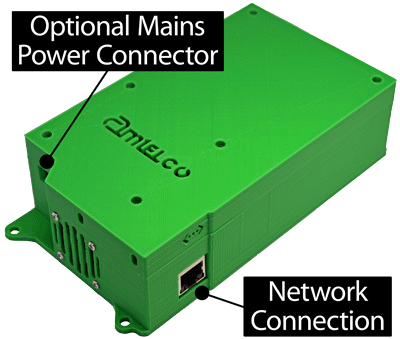 Due to continuing customer requests for a high density enhanced conferencing board, Amtelco XDS has your solution! I'd like more information about the Resource Board! Amtelco XDS is a Digium® Asterisk Interoperability Partner. If you are building an Asterisk application contact Amtelco XDS today! Other operating systems are also available. You are receiving this email because of your relationship with AMTELCO XDS Technologies. Please reconfirm your interest in receiving emails from us. If you do not wish to receive any more emails, you can unsubscribe here.